When Tami first emailed us about their engagement session, they were pretty open to anywhere in Utah, they just wanted adventurous desert engagement photos. Well, if you know anything about us you know we love that type of email AND you know we're going to suggest somewhere around Moab because we truly believe it's the best place ever. They were down and their only request for location was epic cliffs so I knew exactly where to take them! Dead Horse State Park is such an underrated place because of how close it is to Canyonlands National Park, but it's one of our favorite spots, especially for sunset. After you look through these photos you'll laugh at this, but in one of her first e-mails to me Tami said she was awkward in photos. Yeah, nope. Tami and Ethan were so amazingly natural for their photo session I kept joking I was going to use their photos in a guide for future clients (I'm seriously considering this) because they were THAT good. 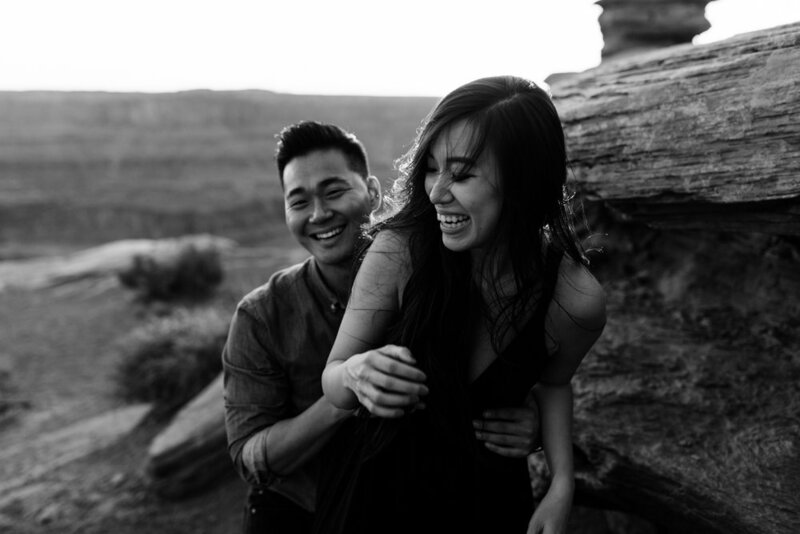 It might have something to do with the fact that they had pulled an all-nighter the night before, flown to Salt Lake City, and then driven across the Utah desert to Moab to meet up with us, but these two just had so much fun with their session (maybe they were just loopy??)! Side note - I still don't get how they looked so dang good after no sleep ;) After meeting up and grabbing some coffee, we hiked around Dead Horse Point State Park taking in some of Moab's best views. We had a great time walking through the desert together and stopping at different overlooks to see the sweeping canyons. We made our way to the main point overlooking the Colorado River for sunset and watched the last bit of light over the La Sal and Henry mountains in the distance. This adventure engagement session was most definitely one for the books!